Both a step toward the future and a step back in time, this sophomore release will have your toes tapping and your heart singing along. -Alison Fensterstock, New Orleans Times-Picayune Being the best in town is nothing new for Meschiya Lake. Even more than two decades ago at the age of nine when both the town and Lake were much smaller. Looking back, it’s no surprise that when a precocious nine year old Lake hit the stage for a singing contest at a Rapid City, South Dakota, steakhouse, she already believed that she belonged. “The other contestants thought it was cute that the kid wanted to participate. I’d always loved singing and I was always doing it around the house, so it made sense to try,” Lake said. And when she won the contest, the $500 prize, and the weekly in- house singing gig that came along with it, it made sense that – in some form or another – the groundwork for a career had been laid. Even if she didn’t realize it herself at the time. For several more years singing for fun and joy continued to trump music as vocation for Lake. Eventually though got back to performing—albeit in a non-traditional outlet. It was only during her stint as a member of the Know Nothing Family Zirkus Zideshow and End of the World Circus – a ragtag troupe that blended traditional circus arts with modern sideshow varieties – that she ultimately realized exactly what she wanted to do as an adult. While the show flitted from outpost to outpost, Lake, by then in her early twenties, derived particular joy in reaching the sorts of small- town, misfit youngster that she’d been while growing up in Rapid City, South Dakota— far away from the big cities and big stages that Lake and her voice would later inhabit. The chance to make those connections with audience members even trumped the taste of her unusual stage snacks. “I realized the uncharted nature of it was what I was proud of,” she said. “My favorite things were to play those small towns and reach audiences that didn’t know these sorts of things were possible. One particular interaction stands out. As for her, fate again intervened when work life slowed. The circus schedule of six months on, six months off ultimately brought Lake to New Orleans for a prolonged stretch of downtime. It was her first visit, and just like picking up a microphone for the first time decades earlier she instantly felt the city’s pull. That was more than ten years ago. And except for a one-year exodus to Milwaukee, it’s been home ever since. Now 33, Lake has long since ditched the circus gimmicks and instead focuses entirely on her voice, which she uses as a powerful instrument most nights a week in gigs throughout the city. 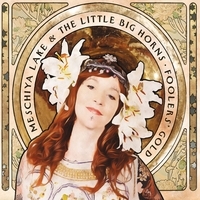 In 2007 she began singing with the Loose Marbles, a traditional jazz outfit on Royal Street; a year later she formed the Magnolia Beacon with Erika Lewis; in the Spring of 2009 she went on to create The Little Big Horns Jazz Band. The latter affiliation has taken her around the globe with stops at such venerable stages as Lincoln Center and major international festivals in the United States, Brazil, Denmark, the Netherlands, Russia, and the U.K. Along the way Lake and the Little Big Horns have garnered such praise as “one of the most entertaining bands on the planet,” from the venerable British rock magazine R2. Back home in New Orleans, Lake has been recognized as Female Performer of the Year three years running by the Big Easy Awards. Their first CD, Lucky Devil, features a top-of-her-game Lake using the full range of vocal and songwriting skills she’s developed through lessons, experience, and hard work since first hitting that South Dakota stage. On the fifth anniversary of Hurricane Katrina in 2010, Lucky Devil was honored by David Kunian on National Public Radio’s All Things Considered as one of his four favorite albums of the year. “Meschiya Lake rocks back on her heels, lifts her chest, and opens her throat like an air raid siren to croon in a thrilling pre-microphone style that...can make you feel by turns as though you were shivering around a campfire in a railroad yard or drinking in a Budapest nightclub in 1938."